Vancouver, Canada - September 4, 2012 - fSONA Systems today announced two new free space optical wireless systems capable of transmitting up to 2.5 Gbps (2xGigE, OC48/STM16) of full duplex bandwidth. The SONAbeam® 2500-E and SONAbeam 2500-Z mark another step forward for fSONA's SONAbeam product line. The SONAbeam 2500-E and 2500-Z systems are ideal for enterprises that need high capacity connections between offices but are also excellent options for service providers who want to offer high capacity services to their enterprise customers. The SONAbeam 2500-E typically operates at distances up to 1 km, and the SONAbeam 2500-Z up to 350m. Both systems utilize a pair of GigE interface ports to provide 2.5 Gbps, full-duplex links via an indoor multiplexor. "Our customers have told us they require more bandwidth for certain applications but they prefer a single link solution," comments fSONA's Chief Executive Officer, Andrew Grieve. "Other 2.5 Gbps wireless solutions pair two systems together at added expense. The SONAbeam 2500-E and 2500-Z both offer the highest capacity wireless connection in an economical, single link solution making them ideal for connecting satellite or campus office buildings or for service providers who need to bridge the last mile." SONAbeam eliminates the substantial costs of digging up streets and sidewalks required to install fiber while also avoiding recurring costs. Unlike other wireless solutions, the SONAbeam is immune to electro-magnetic (EM) and radio-frequency (RF) interference which means no licensing is required. fSONA Networks manufactures the highest-quality, highest-performance, free space optical wireless communications equipment on the market today. Key to SONAbeam's breakthrough laser technology is its operational wavelength of 1550 nm, which provides a broad spectrum of safety and performance advantages. The SONAbeam's high-powered laser transmitters are able to penetrate heavy rain, snow and fog far more effectively and consistently than any other available FSO technology. fSONA Networks Corp is an innovative provider of next generation optical wireless (also known as Free Space Optics, or FSO) solutions that utilise a flexible point-to-point architecture and protocol transparent design. Founded in 1997 with a goal to develop premier, low-cost, eye-safe, optical transmission products for the broadband access market, fSONA has created the toughest, most powerful free space optics systems ever brought to market - the SONAbeam® family. 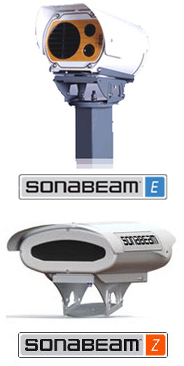 fSONA and SONAbeam are trademarks of fSONA Systems. All other trademarks may be properties of their respective companies.